Make sure your Dixon Commercial mower is cutting its best by replacing your cracked and worn Lawn Mower Belts. Jack’s has a large variety of Replacement Commercial belts for your Dixon Commercial Lawnmower. 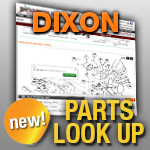 Click the links below to search by size, or to find your Exact Replacement Lawn Mower Belt. Don’t forget Jack’s discount for commercial customers. Sign up (link to sign up page) for a commercial account today!